The 1718 QuiltAlong - Month One! Hello all! I know a lot of you have been hanging on this info and apologies for the delay. A few Typepad issues prevented me from blogging, but now we're all sorted and ready to go. So the news is this! 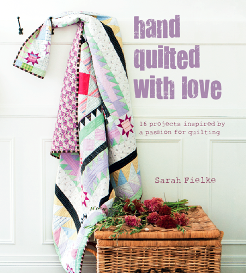 I've been wanting to make this quilt ever since I first saw that the book was coming out. And so I Instagrammed this intention (because nothing is real unless it's on Instagram) and others expressed the need to make this awesomeness too and suddenly we had an Along, which has had to wait until mid February to start because I had to finish said book! *Instructions on which blocks we are making each month and pics of the blocks we have made, tips etc BUT NOT MEASUREMENTS will be on my blog and Amy Lobsiger's blog each month. Amy and I will take turns to write the blog, month on, month off and we will both post on social media and our on blog when the new month's block numbers are posted. so please get involved, it's great to see what others are doing and be inspired by it. Amy and are are both happy to be your Facebook friends and your Instagram friends, so you can find us under our names on Facebook and as @sfielke and @alobsiger on Instagram. *Starting with February, (i.e. right now! ), the 1718 Quiltalong will run for 11 months. In February we are starting with only 9 blocks to give you an easy start (and seeing as February is already half gone! ), and they are all pieced blocks not appliqued except for one. The other months will be broken down into groups of blocks (more at the end of this post). This is just how I'm proposing to do it. If you want to do it another way, slower or faster or anything else, thats just fine and you can still quilt along with us and post your progress! All Amy and I are doing is providing suggestions and a few tips, inspiration and encouragement. *Everyone joining in MUST own their own copy of The 1718 Coverlet by Susan Briscoe. It isn't OK to look on with your friend's copy, or photocopy from their copy or from a library book. That's a breach of copyright. You need your own copy, and trust me it's well worth it because the book is lovely. 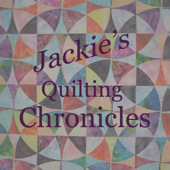 *Please feel free to chat about your blocks and your process and the quiltalong online or on your own blog - please link to my blog and/or to Amy's blog when you do. But PLEASE, don't post tutorials or block measurements or any other kind of instruction other than little tips on what you found easiest or your colours etc, because that's a breach of Susan's copyright too and that's not OK. Right! Now for the fun stuff! Amy and I chatted about how to approach the quilt - it's tempting to make it all in rows, or all the same block numbers first, but we felt that left us with months where EVERYTHING was going to be applique and no piecing, and vice versa. There's a lot of blocks and a lot of applique so we wanted to break everything up a little more manageably. and they also will do the pack or the book on it's own, and they have some nice woven stripes etc like I am going to use too. Drop them an email and they will sort you out. I should first point out that I am making the quilt using the MODERN METHOD instructions given in the book. 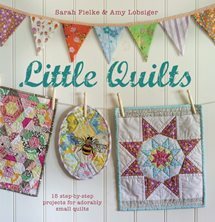 While the ORIGINAL METHOD instructions look fascinating and I'd love to give them a go, I would also like to finish this quilt before I have to start my next book! So the modern method is quicker and easier as far as I'm concerned. If anyone is going to attempt the original method I will be really interested to hear about your progress! I am going to use a combination of hand piecing, machine piecing and hand applique. Where the blocks are easy to work out machine piecing instruction or aren't too complex, I'm just going to quickly run them up on the machine. Where they look a little more fiddly I will hand piece, and I will hand applique everything. Machine applique would be fine for this project if you're wondering what to do - however as a passionate needleturn appliqué teacher I would encourage you all to give it a go!! If you haven't ever done needleturn applique before you will find instructions for my method in the back of Hand Quilted With Love, Little Quilts and also in my Craftsy class, Big Techniques from Small Scraps. I've decided to use a combination of shot cottons and stripes, Oakshott shot cottons and Liberty prints. I really wanted to use solids so that the quilt looked a little like the original only more saturated. I just love that line of Oakshotts. Yummo. I did try a few other combos with no happiness and so my trusty Liberty came out. 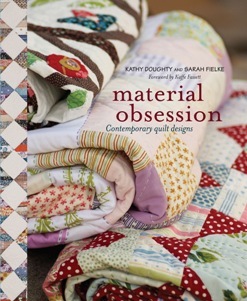 I do have rather a lot, and they make such a lovely scrappy quilt. As I'm using the modern instructions, the pieced blocks came together quite fast, I machine pieced all the straight lined blocks, and I used a 1/4 square triangle ruler to cut the hourglass triangles. I will use a half square ruler where I can too, much quicker to cut, more accurate and saves fiddle. and then hand pieced blocks 2 and 5 and did the appliqué in front of the TV last night. I also decided I would just piece a 4 patch behind the applique blocks instead of all the patchy pieces - well at least, behind this first one, I might get more fiddly as I go along. I don't think it will matter in a quilt as scrappy and busy as this one. I just have to finish another Block 2 and another Block 5 tonight and my February blocks are done. Anyway I hope that is everything, if you have any questions you can leave a comment here or on Amy's blog, on the Facebook page or email me at sarah@sarahfielke.com. If you want me or Amy to see a post on Instagram please TAG US with @sfielke or @alobsiger as it's easy to miss a comment that's just on the hashtag thread. Have fun! ** IN ANSWER TO THOSE ALREADY ASKING - yes I DO sell the kits for my applique technique, and I also sell the threads I use for hand applique - Aurifil 50 weight. 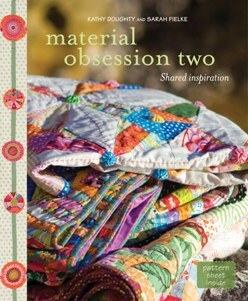 You can find the kits and my thread collection (and my books and fabric collections) at www.sarahfielke.com under Notions. 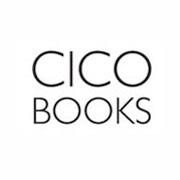 I DO NOT sell Susan's book. Week 7 is all ready to stitch! 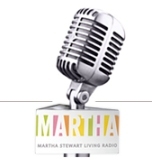 It's not too late to join in the fun, all the patterns are still up on the Spotlight web page for you to catch up. You can download the pages for printing from the website or Spotlight's Facebook page. If you decide to sew along with us, don't forget to join the Millefiori Facebook page for the latest news and updates, and to share your work. If you have made something with Millefiori you can show us there too! Ugh! Talk about your long pause. Husband's spinal surgery, busy busy boys and a load of deadlines for two new books and two new fabric ranges has left my blog high and dry! Popping by in a post all nekkid with no pics or anything, to say that I am teaching a class this coming Friday the 13th (scary ghost noise) at Kim Bradley's new shop in Castle Hill, Kimpossible Quilting. So if you are close by and want to come along we would LOVE to see you. Contact Kim at kim@kimbradleycreations.com for bookings. Hiedy-ho patchwork-erinos, Blocks 5 and 6 are live online at Spotlight for your viewing pleasure. I especially love those little stars. I'd like a whole quilt in that. :) If you are making the mystery quilt along with us, or indeed anything from On the Pond, make sure and join in to the On the Pond Facebook page where you can post pics of what you're up to. Spotlight Mystery BOM Block 3 + 4! Patterns for Block 3 and 4 are up at the Spotlight website for download! FREE Mystery On the Pond Spotlight BOM! I'm so excited to announce that the first week of my free quiltalong with my On the Pond fabric starts today! If you are an Aussie or a NZer, and on Facebook, you can go over and "like" their page to download it - it's worth doing as you will also get notice of any specials etc they have going on. 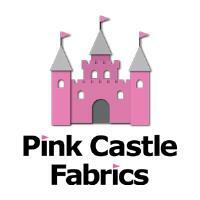 I will be selling kits for the BOM, and also selling the fabric by the metre. This is for overseas customers ONLY however. Its $16.99pm in store and from me - however if you're a Spotlight VIP you can get it from them for $12.99pm, it's mad to buy it from me when you can go instore and get it for $4 cheaper! Without further ado, here is week one of the BOM, for those who don't have Facebook etc - and the fabric requirements to make the whole quilt. If you do quilt along with us, wether here or overseas, make sure and send me a pic. *** CORRECTION*** there is a small typo in the pattern for week 1. The instructions say to cut pieces from the white to 2 7/8". They actually need to be cut 2 3/8 as it states lower down the pattern. If you cut and sewed your pieces already don't worry - it won't make very much of a difference to this pattern so it's a very minor change! Ok so if you know ANYTHING about me, you know that I love hand quilting a really really lot. Like, better than everything. 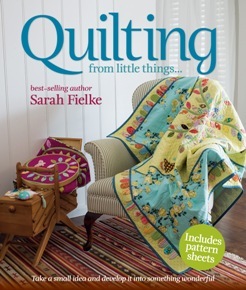 And what I love even more is teaching all of YOU to hand quilt and creating new hand quilters!! 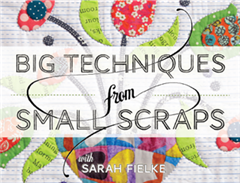 To that end, here's a little prezzie from my friends at Craftsy - a FREE hand quilting tutorial with me. 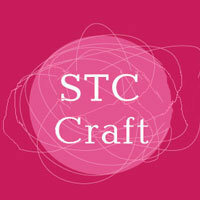 If you like it, why not check out the rest of my Craftsy class?